The Association administer The Scottish Police Golf Championship,innaugurated in 1920,and comprises a committee of management drawn from the 9 forces in Scotland. It is hoped to develop this page to bring news of the Scottish Police Golf Championships. Founded in 1887, Irivne Golf Club have always occupied the present site at Bogside. The course was redesigned in 1912 by Open Champion Harold Hilton and again in 1926 when the great James Braid made further alterations. At 6423 yards long, with a par of 71, the Bogside course has all the attributes associated with links golf, including tight fairways, whins, blind shots, fast and true greens and well placed bunkers which punish the wayward golfer. The standard of test provided by the course, which unusually has only two par threes, has brought many local and national championships to the club over the years, and the course has been used regularly as a final qualifying course for the Open Championship at Royal Troon and Turnberry, and will be used as such again when the Open Championship returns to Ayrshire in 2009. Irvine Golf Club has produced many fine golfers over the years, with the Scottish Championship winning triumvirate of McInally, Walker and Cannon who are legend not only in Ayrshire but in Scottish amateur circles, being the most celebrated. Hammy McInally took the Scottish title three times, in 1937, 1939 and 1947, whilst former police officer Jimmy Walker won the title in 1961, a year when he also reached the final of the Amateur Championship at Turnberry where he lost out to (Sir) Michael Bonallack and was subsequently selected for the Walker Cup team. The third member of the club to take the national title, in 1969, was Jackie Cannon who still remains the oldest winner of the Scottish Championship to date. Memorabilia of the triumvirate, including their national medals, can be seen in the clubhouse at Irvine, alongside national and international medals won by Alan Tait, the present Director of Golf at The Carrick, Loch Lomond, who developed his game as a junior member over the Bogside links. The Bogside course will undoubtedly test the skill and patience of competitors in the Scottish Police Championship, whilst providing a most enjoyable experience of championship links golf. Bunkers and heather await the wayward tee shot on both sides but a straight drive should set up a long to mid iron blind approach to a green, well guarded by bunkers, particularly on the right. Avoiding bunkers from the tee is the key to this short par five. A good tee shot should give the longer hitter the opportunity to reach the green in two and set up a birdie chance. The green, which falls away gently to the back right and is guarded by bunkers either side, is hidden behind a low mound in the fairway. A short par four with a deep and wide gully in front of the green. A good positional shot from the tee is required to set up a short iron approach to the narrow green. The approach must be accurate as heavy rough and whins await an overhit approach, whilst a short approach will gather into the gully, leaving a very difficult chip up to the green. Another short par four, requiring accuracy more than length from the tee. The main West Coast railway line is out of bounds on the left, running the full length of the hole. A good tee shot will set up a short iron approach to the plateau green, and although the hole is devoid of bunkers, danger awaits the overhit approach, with the River Irvine and the railway line lying behind the green, whilst an approach hit short will leave a difficult recovery chip up to the green. This is a short par four to an elevated green, lying on the top of a sandface, from which the hole takes its name. The longer hitter may be tempted to go for the green, which is reachable in the right conditions, and could well be rewarded with a birdie or better if successful, although the pitfalls of failure are many should the green be attempted. The sensible play is a positional tee shot short of the fairway bunker, leaving a short iron approach up and over the sandface to the green. A long par four where the second shot is played from the top of cannon hill to the green in the low lying ground below. In calm conditions the longer hitter is faced with the choice of attempting the long drive, positioned to the right of the marker post, in order to clear the brow of the hill and leave a much shorter approach shot, or playing the safer positional tee shot to the top of the hill to leave a long iron approach to the green. Bunkers also await the long drive at the base of the hill, so an element of luck is needed if the long drive is attempted. The green is well guarded by bunkers and an approach shot should err to the right for safety, as a shot pulled left and slightly long can find its way into the nearby River Irvine. Running alongside the old Bogside race track, the ideal tee shot here should avoid the fairway bunkers and be positioned short of the slope up to the green, to leave a straightforward approach with a short iron. An overhit tee shot can run into trouble, particularly on the bank on the right. The green gathers from the back right and the position of the hole should be noted as a misjudged approach can leave a long putt on this green. The first of only two par threes on the course, accuracy from the tee is key as the green is well guarded on both sides by bunkers and, as the name of the hole suggests, the putting surface tends to shed the ball towards the surrounds, from the middle of the green. A long par four to finish the outward half, which dog legs to the right. Two well positioned bunkers await the slightly wayward tee shot on the right, with heather on both sides of the fairway awaiting the wayward shot. A good tee shot to the dog leg will leave a long iron approach to the green which is guarded by four greenside bunkers. A fine par four where a good drive should come up short of the mid fairway bunker, positioned 317 yards from the tee. The approach shot should be hit to the right of the flag where the slope of the green from right to left provides one of the significant defences on the hole. A very long and testing par four which dog legs to the left. The ideal tee shot is over the group of bunkers which lie 206 yards from the tee, leaving a long iron approach to a narrow green, guarded by bunkers on both sides. A difficult hole where par will be a very good result. This is a shortish par four which dog legs to the left, dropping down to the green which lies at the foot of a slope. Position from the tee is more important than length. With three bunkers at the apex of the dog leg, the ideal tee shot is just to the right of, or over, the furthest right of the trio. This will leave a short iron approach which will need some skill and imagination, depending on the prevailing conditions, to negotiate the slope to the green and successfully hold the putting surface. An excellent par four with a blind tee shot over a grass bank. The tee shot should be over or right of the marker post as anything to the left is likely to flirt with the out of bounds fence which runs the length of the hole on that side. The approach shot, generally a mid to long iron, is played to a narrow green which is guarded by bunkers on both sides. Err to the right with the approach for safety, as the out of bounds fence lies only a few yards to the left of the green. Avoid the bunkers on both sides of the fairway from the tee to set up a mid to short iron approach to the green which lies over a grass bank containing the two bunkers from which the hole takes its name. The green is two tiered, making the accuracy of the approach important if a three putt is to be avoided. Named after the village which formerly stood nearby and was home to the Irvine clubs three Scottish Champions, this short par four is relatively straightforward if the bunkers which await the wayward shot are avoided. The approach to the green is narrow and guarded on both sides by small bunkers, whilst an approach which is too long will leave a difficult chip back up the slope at the back of the putting surface. The second of the par threes on the course, bunkers guard the front and both sides of the green. Although there are no bunkers through the green, a slope at the rear makes any recovery from there a stern test. Considered by many to be the most difficult tee shot on the course, accuracy is essential with whins and heavy rough on the right, whilst the fairway on the left slopes down towards heather and rough. A good tee shot leaves a mid iron approach to a green which gathers the ball in from both front and back. The final tee shot does not need to be long, with the main objective being to negotiate the grass bank in front of the tee. The tee shot should be aimed at, or right of, the right side of the clubhouse as heavy rough and out of bounds awaits the wayward shot to the left. A successful tee shot will leave a short iron approach to a green which is guarded by seven bunkers and a gully to the front. The approach should err to the right side of the green for safety as the out of bounds line lies very close to the left edge of the green. Founded in 1893, West Kilbride is the most northerly of Ayrshire’s true links courses, occupying a narrow strip of links land and raised beach, with superb views over Arran and the Firth Of Clyde. Designed by Open Champion and renowned course architect, James Braid, the 6423 yard, par 71, layout is exposed to even the slightest breeze and consequently the wind strength and direction can add to a demanding but enjoyable test for all levels of golfer. The reputation and quality of the course has led to many local and national championships being held at West Kilbride, including the Scottish Youths Championship, The Scottish Ladies’ Championship. 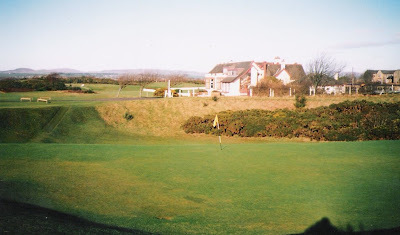 The Scottish Boys Championship has also been played at West Kilbride regularly since the early 1990’s, the most recent occasion being in 2006. With large and healthy gents, ladies and junior sections, West Kilbride has produced a number of excellent golfers over the years, the most notable in recent years being former Scottish amateur caps, Graeme Fox and Laura Moffat, and current Scottish Boys cap, Cameron Gray. The club has also contributed to golf administration at the highest level over the years. Former R & A Captain, the late Sandy Sinclair was a member of the club for many years, whilst SLGA President and former LGU Chairman, Nancy Chisholm is numbered amongst the present membership. Along with Irvine (Bogside), West Kilbride will provide a testing but enjoyable challenge for competitors in the 83rd Scottish Police Championship and will allow players to experience Ayrshire links golf at its best. The opening hole is a relatively short par four, with out of bounds running along the right. A straight tee shot, avoiding the well placed fairway bunkers, will leave a short iron approach shot, over the burn which passes in front of the green. A well positioned tee shot to the corner of the dog leg will leave a medium to short iron to the plateau green. The tee shot is crucial. Beware trying to cut off too much of the dog leg on the right, which can leave a very difficult approach from heavy rough, whilst gorse awaits the tee shot hit too far left. There is trouble both right and left from the tee but the landing area is generous. There is an area of dead ground between the path which crosses the fairway and the green, which should be noted when selecting the club for the approach shot. A very good opening par three where the player should be content to aim at the centre of the green, regardless of pin positions. A straightforward par four that turns back towards the clubhouse and the normal prevailing wind direction, which can make the hole more testing. A good second shot is required to hit the narrow elevated green. Another par four which plays towards the prevailing wind direction, it is important to miss the fairway bunker to leave a mid to short iron to the large double green shared with the seventeenth hole. A long par 5, generally played downwind, this hole requires a carefully placed second shot in order to avoid the fairway bunkers scattered around the landing area. If the player successfully negotiates the bunkers, the approach to the green is straightforward. Requiring two good shots to reach the green, this is a testing par four. Avoid missing the green to the left, as to do so will leave a tricky pitch. A long par three, generally played with a crosswind. Be careful not to hit too much club as out of bounds lies only a few yards beyond the green. With out of bounds both left and right from the tee, a well struck tee shot is required. Out of bounds also lurks close to the left side of the green so any approach should be played towards the right side of the putting surface , regardless of the pin position. A tempting par four which is very much reachable with the tee shot, in good conditions. Danger lurks however, as the green is well guarded by bunkers and the elevated putting surface can make an up and down difficult if the player finds his ball lying at the same side as the pin. Another well guarded par three where an accurate tee shot is required if a par in to be secured. A superb par four which can be made extremely testing when played into the prevailing wind. The hole is a slight dog leg to the right with out of bounds running the full length of the hole, on the right. The approach shot shoud be played to the left half of the green as out of bound lurks close to the green on the right. The positioning of the tee shot, favouring the left and short of the fairway bunkers, will leave a simple pitch to the green. A dry stane dyke awaits the wayward shot to the left, and provides an additional hazard to recovery from an approach leaked left of the green. Generally played into the prevailing wind, the ideal tee shot should be up the left. The hole generally plays longer than the yardage suggests. The green is two tiered and long, making a two put no certainty if the approach falls short of, or too far past the hole. A good tee shot down the left is required in order to negotiate the burn and set up a straightforward approach. Guard against going too far left however, as a wayward drive can be hampered by the building to the left of the green. A straight tee shot is the order of the day, to avoid any interference with the burn which crosses the rough on both sides of the hole. Two solid shots are required to reach the large double green, shared with the 6th hole.